Mr. Sanjay Kothari, Secretary, Department of Administrative Reforms & Public Grievances, Government of India and Tan Sri Mohamad Zabidi Bin Zainal, Director General of Public Service signed the Memorandum of Understanding(MoU) for cooperation in the field of Public Administration and Governance in Putrajaya on 25 November 2013,in the presence of Tan Sri Dr. Ali Bin Hamsa, Chief Secretary to the Government of Malaysia and Mr. K.N. Ramachandran, Acting High Commissioner of India. 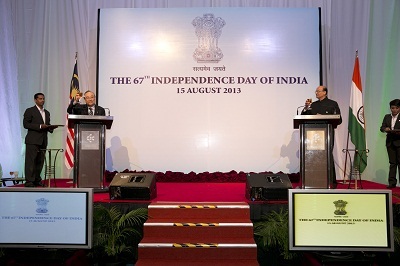 67th Independence Day of India – Toast by Guest of Honour, H.E. Senator Datuk Paul Low Seng Kuan, Minister in the Prime Minister’s Department, and High Commissioner Shri Vijay Gokhale. 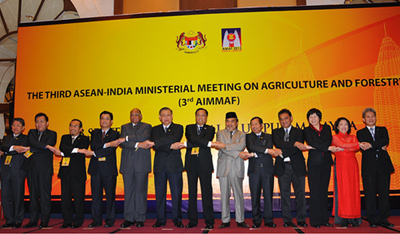 (From L to R) Dato' Seri Samy Vellu, Malaysian Special Envoy of Infrastructure to India and Southern Asia, Tan Sri K.K. Eswaran, President, MAICCI, Guest of Honour Senator Datuk Paul Low Seng Kuan, Minister in the Prime Minister’s Department, Ven. 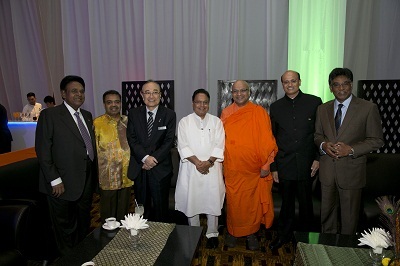 Datuk Kirinde Dhammaratana Thero, Chief Incumbent of Buddhist Maha Vihara, Kuala Lumpur, High Commissioner Shri Vijay Gokhale, Dr. Xavier Jayakumar, MLA, Selangor State. 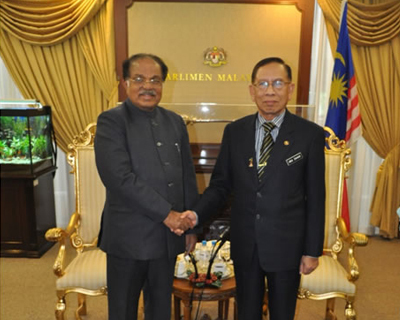 Speaker of the Dewan Rakyat, Malaysia, YB Tan Sri Datuk Seri Panglima Pandikar Amin Haji Mulia, meeting with Smt. Meera Kumar, Hon'ble Speaker, Lok Sabha in New Delhi on 30 July 2013 during his working visit to India. 10th Malaysia India Defence Cooperation Committee (MIDCOM) Meeting held at New Delhi on 21 Jun 2013; co-chaired by Dato’ Sri Dr Haji Ismail bin Haji Ahmad, Secretary General, Ministry of Defence, Malaysia and Shri RK Mathur, Defence Secretary, Ministry of Defence India. 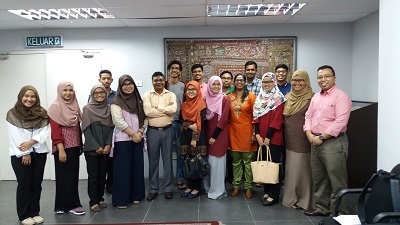 Courtesy call on H.E. Shri AK Anthony, Minister of Defence, India by Dato’ Sri Dr Haji Ismail bin Haji Ahmad, Secretary General, Ministry of Defence, Malaysia on 21 Jun 2013 at New Delhi. Ms. Praveen Mahajan, Chairperson, Central Board of Excise & Customs, Government of India and Dato’ Sri Khazali bin Hj. 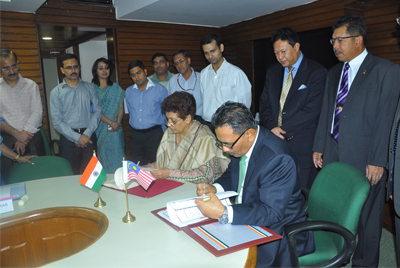 Ahmad, Director General of Customs, Royal Malaysian Customs Department, Government of Malaysia signing the MoU between India and Malaysia on Cooperation and Mutual Assistance in Custom Matters in New Delhi on 13th June 2013. Rear Admiral Ajit Kumar P, VSM, Flag Officer Commanding Eastern Fleet, during his courtesy call on to Vice Admiral Datuk Mohammed Noordin Bin Ali, Deputy Chief of Royal Malaysian Navy on 27 May 2013 at Ministry of Defence alongwith Captains of Ships of the Fleet. H.E. Prof. P.J. Kurien, Member of Parliament & Deputy Chairman, Rajya Sabha met H.E. Tan Sri Abu Zahar bin Dato' NikaUjang, President, Dewan Negara, Malaysia at Dewan Negara, Kuala Lumpur, Malaysia on May 28, 2013. 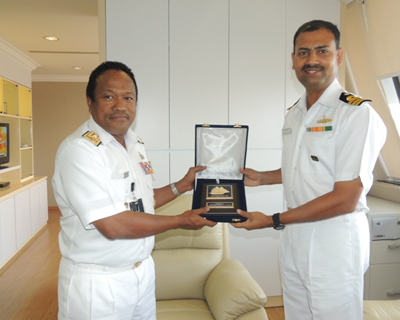 Cdr N ShyamSundar, Commanding Officer INS SUDARSHINI presenting a memento to Rear Admiral Dato' Abdul Ghani bin Othman, Assistant Chief of Staff Planning and Operations at MINDEF on 18 Feb 2013 during a Courtesy Call.